Mondo has revealed there latest Shaun of the Dead post effort by Artist: Rich Kelly. The 18 x 24 poster goes on sale at a random time today at mondotees.com, and is a limited edition of only 300 posters. 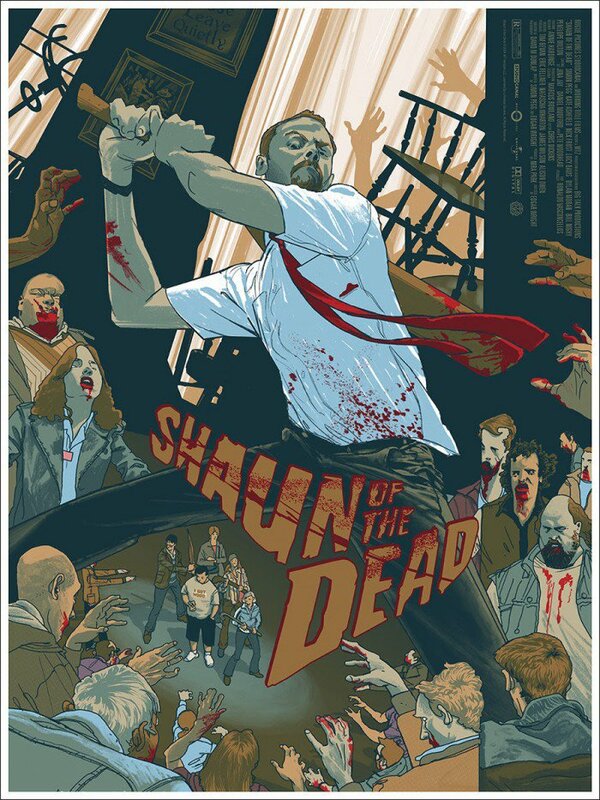 This is the third Shan of the Dead poster the studio has done following the epic efforts of both Tyler Stout and Jock. If you want one of these posters you bette start refreshing the Mondo website now considering the popularity of this film. Mondo will tell you to keep an eye on their Twitter @MondoNews for the random drop, but if you do this don't expect to grab a poster. Nearly all Mondo drops are done between a 11 a.m and 1:30 p.m Eastern, and if you link over via their Twitter you will be too late, instead as previously mentioned keep your browser on the Mondo site, and start refreshing. Let us know what you think about the poster in the comments below or tweet me @thereelbradbell if you snag one!